A wide range of faucets exists for the sink, bathtub and bathtub/ shower units, and technology has considerably evolved. Manufacturers have invested time, money and effort in order to improve their products and make them more suitable for contemporary life. Here a guide that will help you choose the right faucets. Faucets are valves that deliver water to a sink, washbasin or bathtub. They mix hot and cold water in one of two ways. Single-handle (also called single-lever or single-control) faucets have garnered a large share of the market in recent years. 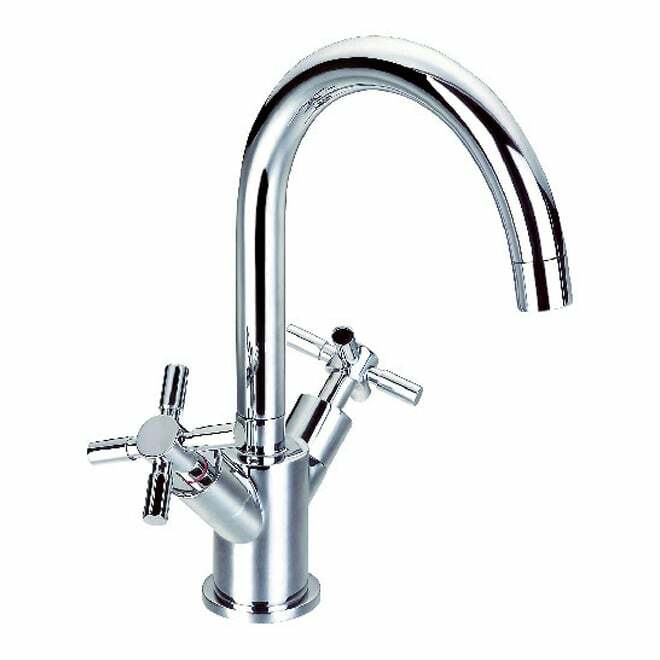 Water flow and water temperature are controlled by moving the single lever handle up and down, and to the left and right, respectively. This type of faucet is ideal for anyone with reduced grip or physical disabilities, since the water volume and temperature can be controlled easily with one hand. Two-handle faucets have two separate handles – one for hot water and one for cold water – and a common spout. This type of faucet allows for accurate adjustment. A valve mechanism inside the faucet controls the hot and cold water flow. This mechanism can take the form of a compression washer, a washerless cartridge (reliable and easy to maintain), or ceramic discs (requiring virtually no maintenance). 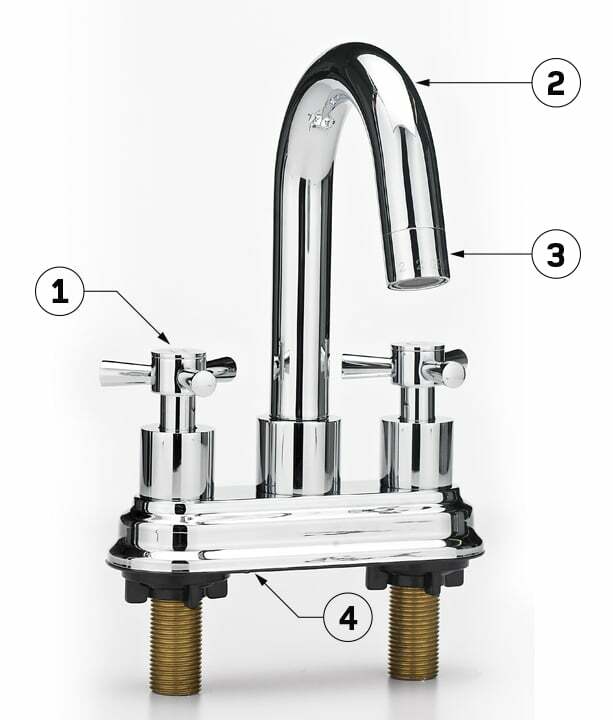 Faucets come in three styles for mounting: single-hole, centre-set and widespread. Single-hole faucets have a spout and usually one handle (but sometimes two) on a single base. As their name suggests, they require just one hole for mounting on a sink, whereas two-handle models require two holes with a 4-inch centerset. It is installed on the wall. These faucets are either deck or wall mounted. Centre-set, single-handle faucets require just one mounting hole for installation on the sink, bathtub, counter or wall. They have one or two handles and a spout. Available in both contemporary and traditional styles, this type of faucet is becoming increasingly popular. The hot and cold water handles and the spout are each installed separately, which requires at least three mounting holes. Models with a separate hand spray will require four holes. The centrespread (distance centre to centre between the two outside holes) generally varies from 8" to 20", although some models, called "mini-widespread", have a smaller, 4" spread. Slightly more expensive than centre-set faucets, widespread faucets offer more flexibility in terms of mounting options. Bathtubs have changed considerably over the decades but the basic features remain the same. Let's take a look at the main ones. 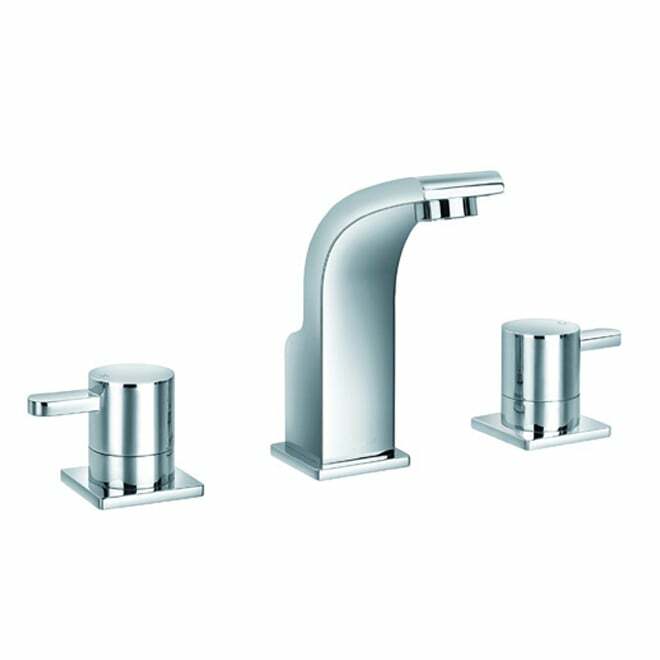 Lever: found on both single-handle and two-handle faucets, levers are a popular option because they are so easy to use. Simply move the lever up, down, backwards or forwards, depending on the model. Lever handles are especially useful for people with a weak grip or who suffer from arthritis. Cross: whether made in a contemporary or traditional style, cross handles are enduringly popular. 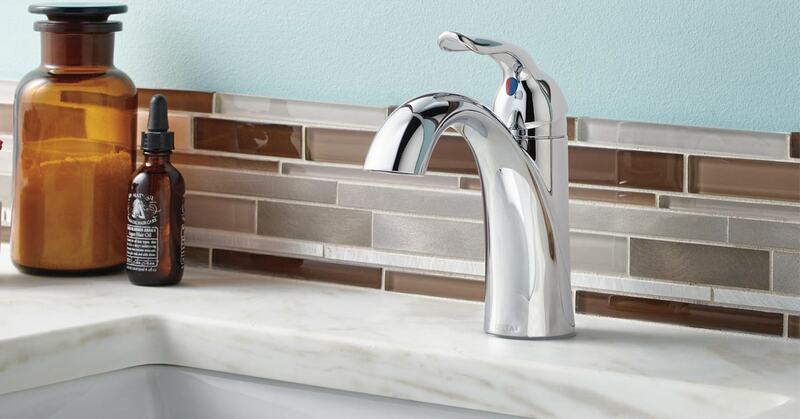 This style is only found on two-handle faucets. Round: round or oval-shaped handles are the classic handle style. They are found on both single-lever and two-handle faucets. Faucets for tub/shower units may also have a third lever to divert the water from tub filler mode to the shower, and vice versa. Waterfall: Also called an open waterway spout; creates a waterfall or cascade effect. Low-arc or high-arc: Curves downwards in an arc; a high arc leaves more room under the faucet and is ideal for vessel sinks. This type of spout may be fixed or swivel, depending on the model. The aerator injects air into the water, which reduces the flow while increasing the pressure. It can reduce water consumption by half. 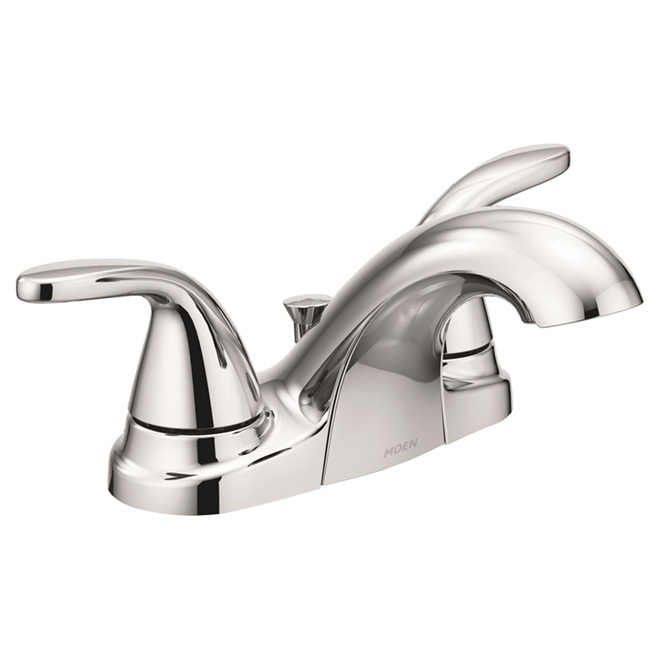 Aerators are not available on all models of faucets – they cannot be fitted on waterfall spouts, for example, which have open ends. The body or base holds the faucet to the sink, countertop or even the wall. Most lavatory sinks and bathtubs on the market come with pre-drilled faucet holes. 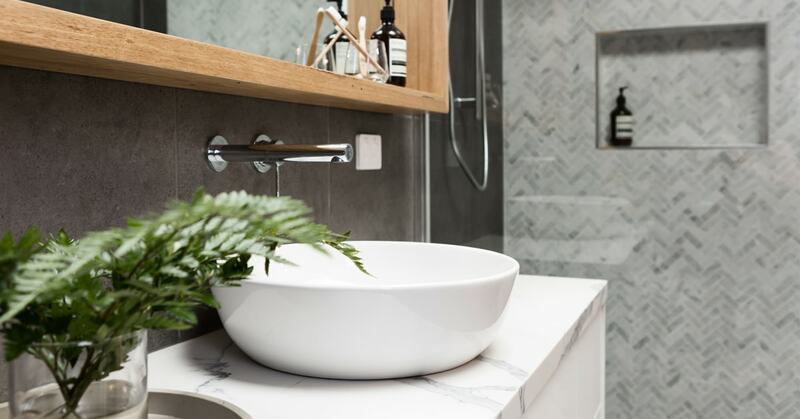 However, sinks made of solid-surface materials and vessel sinks do not have such drillings, leaving you the choice of where to place the faucet. Faucet holes are always spaced at 4" or 8" centre and have a 1½" diameter. Bathroom sinks and tubs can have up to four holes. The drain plug is the water drainage system that is activated by a rod usually connected to the body of the faucet. This plug or stopper may or may not come with the faucet, depending on the model. Chrome: An enduring classic; one of the most durable finishes there is. Polished chrome is shiny and adds sparkle to the room. However, it does show water spots more easily than other finishes. Stainless steel: The most popular finish; known for its antimicrobial properties. A brushed stainless finish will not show finger marks or water spots. It may, however, be prone to scratches. Brass: Brushed or polished, brass is appreciated for its durability. White: Neutral finish; clean look. Bronze and gold: Antique, Brushed, Oil-Rubbed or Mediterranean – a bronze or gold finish evokes the opulence of these precious metals. Brushed nickel: This popular silvery white metal pairs well with stainless steel. 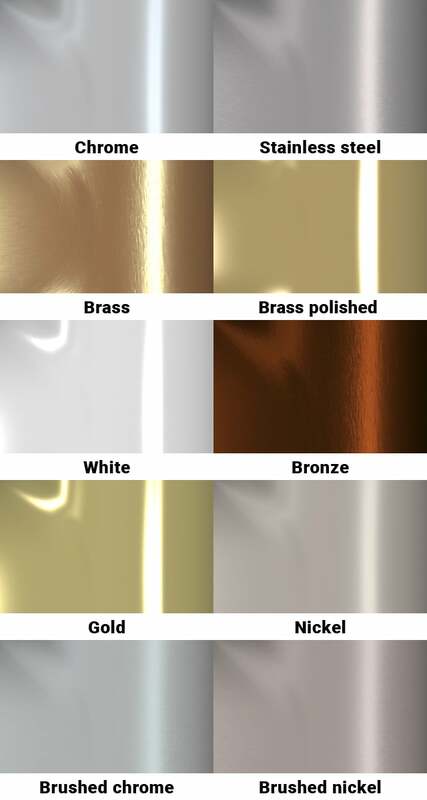 Brushed nickel has a soft, warm feel, while polished nickel is shinier and looks similar to chrome. Thermostatic mixing valves, available on single-lever faucets, regulate water temperature to prevent scalding or sudden cold water, for example, if someone flushes a toilet or puts the washing machine on while another person is showering. Pressure-balance mixing valves maintain constant water pressure. Temperature memory systems allow you to set a preferred temperature and keep it constant. A maximum temperature limit safety feature, set when installing the faucet, determines the maximum water temperature in order to prevent scalding. Some models of faucets are equipped with motion sensors. Commonly used in public washrooms, these faucets are becoming increasingly popular on the residential market, especially in homes with children or people with reduced mobility. High-tech electronic devices are now available which allow water temperature and flow to be adjusted by remote control. Controlling water flow helps to save water and reduce clean and hot water consumption costs. Faucets for tubs, showers or tub/shower units must have a maximum flow rate of 2.5 gpm (9.5 L/min). Some models deliver 1.75 gpm (6.6 L/min). An automatic shut-off mechanism will turn the water off whenever the faucet it is not in use, simply by blocking the water supply. When the faucet is turned on again, the temperature does not need to be readjusted. This system also keeps water consumption to a minimum and prevents overflow or flooding caused by leaving a faucet on. Faucets can be deck-mounted on the rim of a sink or bathtub, or an adjacent surface. In this case, the plumbing is connected underneath. Wall-mounted faucets are fastened to the wall, with horizontal plumbing connections and the pipes running through the wall. Freestanding bathtubs or sinks may have floor-mounted or freestanding faucets. In this case, the piping is visible and the rough plumbing runs through the bathroom floor. 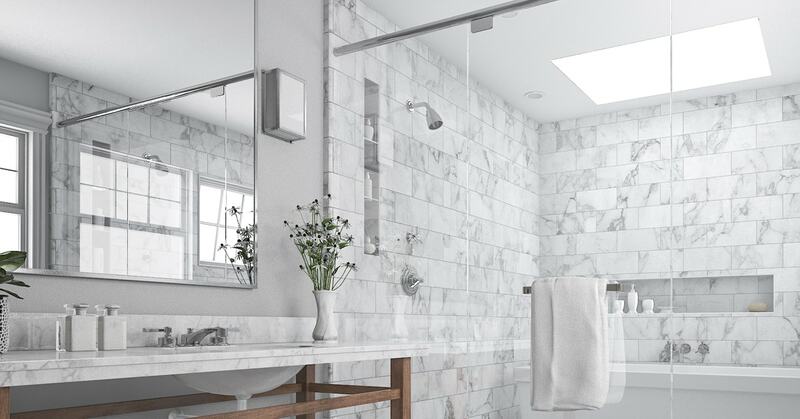 If you are renovating or upgrading a bathroom, it's easier and less time-consuming to install the same type of faucet as the one being replaced. In other words, choose a faucet with the same number of holes and the same centrespread as you have already – likely to be either 4" or 8". Make sure that the existing plumbing connections are compatible with the new faucet. If they are not, you will need to change the connections or install adapters. If there are no shut-off valves under the sink, now is the ideal time to install some. Make sure that the existing pipes are in good condition. If not, it may be wise to replace them. Flexible (braided) hoses are more practical than rigid pipes. For detailed steps, see our DIY projects: Install a lavatory faucet and Install a floor-mount bathtub faucet. For a bathtub or bathtub/shower unit make sure the faucets will not obstruct access to the bathtub. If you must drill holes in the bathtub for the faucets, use a hole saw and make sure not to drill the hole any wider than necessary for the diameter of the faucet pipes. Make sure you leave access to the pipes. Avoid installing pipes next to an exterior wall due to the risk of freezing. Do not hesitate to entrust the project to a professional. Clean the outside of the faucet regularly. Replace gaskets or O-rings if they become worn. Clean or replace the cartridge inside the faucet if necessary. Most types of gaskets and cartridges can be found in stores, but if you are unable to find the part you are looking for, the faucet manufacturer should be able to supply it. Replacing gaskets and cartridges is a simple process that can be carried out with regular tools. The screws to dismantle a faucet are easily accessible; they are usually concealed under a decorative plate or behind the handle cover.